I have read and heard in classes a writer should be able to condense a raw piece of literature down to one word or subject. That’s easy to do when I write flash fiction from a prompt by Charli Mills because she gives us the one word as a starting point. I find it challenging and fun. I love reading all the different takes on that one word. We certainly think and write with a different slant. When applying my craft in other venues such as poetry, memoir or other fiction that one word isn’t so easy to decipher. What is easy is to give credit to my support system for any writing I may accomplish. They encourage me with praise, and sometimes a nudge. I first met my now husband in 2001. I told him I had a novel running around in my head but didn’t know how to go about writing it. He listened patiently for almost ten years then one evening while we were out listening to a Frank Sinatra impersonator, he noticed tears running down my face. He asked why. I told him I had just figured out how I could tie my story together. On the way home, he firmly said, “Now you have the missing piece, sit down and write it or quit talking about it.” I knew he was serious and I wasn’t about to quit talking about it. Halfway through the two-and-a-half-year writing process that started in 2013, he wished at times to never hear me mention it again. It became my total focus. Another nudge happened when I became frightened about the fact all my characters are a part of myself. I wasn’t sure I wanted my readers to know me so well. He assured me only a few people would be able to recognize that, so I went back to writing. The first couple of weeks of actual writing I realized how much research I had to do. I wanted to find an Air Force pilot to model a character after. I called the local Veteran’s Outreach Center, and they directed me to the Rochester Veteran’s Writing Group whose doors are open to all vets, family members, and friends. As an ex-Air Force wife, I walked fearlessly into that first meeting on May 2, 2015, and not only found my pilot, but one that flew the exact airplane I wanted information about. The group has twelve regular members; two from WWII, three Viet Nam and the rest from Iraq and Afghanistan. We write from prompts every month and share our memories in a safe, non-judgmental situation, just like at Carrot Ranch. We have become special friends who understand PTSD, sacrifice, brotherhood and share the love of writing. That ex-pilot and I have read, critiqued and edited each other’s manuscripts. He is one of my best cheerleaders. During the same time, I started taking classes at Writer’s, and Books, a Rochester, NY, based non-profit that promotes writing and reading. I learned about story arc, not using the word was because it tells instead of showing action and that the publishing industry doesn’t like exclamation points. I also joined another local writing group, the Lilac City Rochester Writers which is made up mostly of published authors who are willing to help other writers. I have learned much from their programs. It’s amazing when you put a group of people together who have the same passion how quickly they all become mentors to each other. In my quest for writing knowledge, the fact you must keep writing to improve became apparent, so I started a blog in July of 2016 (susansleggs.com). I share memories and information based on the National Day of Calendar. That’s where Robbie Cheadle found me and became my first international blogging friend. The Tanka Tuesday poetry challenges she entered grabbed my attention. I didn’t use the prompts for poetry but for the keywords in my first efforts at flash. She also introduced me to the Carrot Ranch. I took a flash fiction class in September 2017, and to my delight learned I could write short fiction. I submitted my first 99-word flash at Carrot Ranch last November and look forward to a new challenge each week. The content of my blog has changed, and my group of national and international friends keeps growing. When Charli Mills asked if I wanted to share my writing process I was elated and humbled as my journey is far from over. My novel, even at the end of its eighth draft needs more work. I have let it languish for the last year, and since I have learned to write more concisely, I’m thinking rewrites to tighten the scenes might even be fun now. I need to get to it. The problem remains, my story is a soap-opera type family saga, and they are not the in thing right now. As to my process, there is something I can’t explain. Insights come on a regular basis when I am listening to live music whether it is a crooner, jazz or country. And the irony of the whole situation is I am known for always having an opinion and lots to say, so being recognized for doing something short and concise makes me laugh and want to forge ahead. Thank you to my support system, especially the folks at Carrot Ranch who keep giving me challenges, are positive, and I’m getting to know better as each week passes. 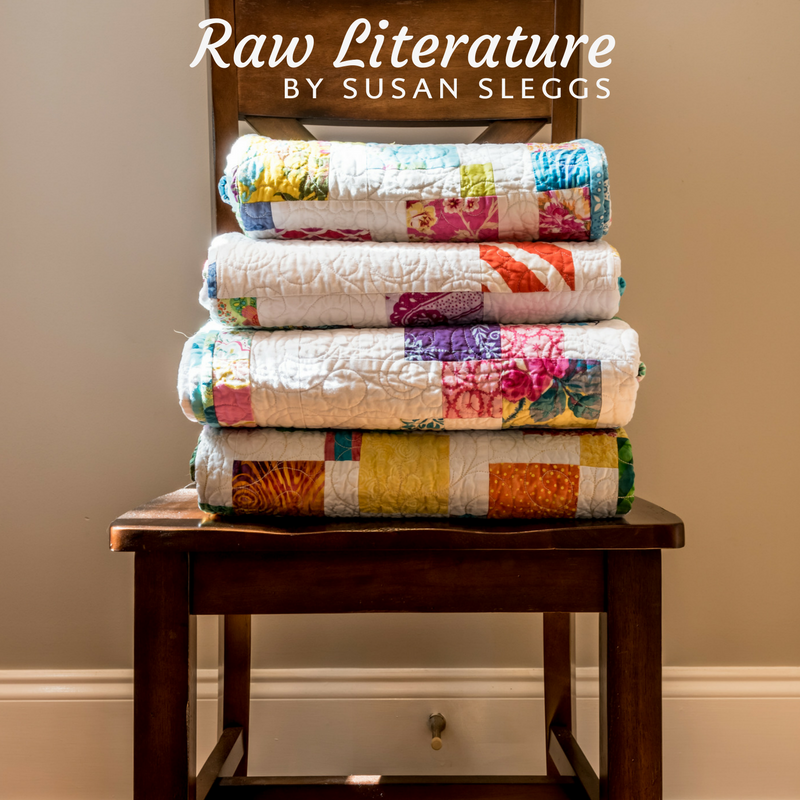 Susan Sleggs is a retiree who blogs from her home in the Finger Lakes region of New York state. She spends as many hours quilting in her sewing studio as she does writing in front of the computer. Memoir, fiction, and free-form poetry are common writing genres, but flash is her current passion.